We’re in the midst of a record-setting heat wave here in Southeast Texas. Yesterday afternoon, in the shade of my back porch, the mercury stretched all the way to 102 on the Fahrenheit scale. In the shade! The humidity doesn’t help matters, either. Anyway, for some reason I decided to leave my cool, comfortable office and get out on the road to do a little book hunting. I’m glad I did. I found a fair number of decent books for my two-hour effort, even if I had to leave my truck baking in the sun for awhile. 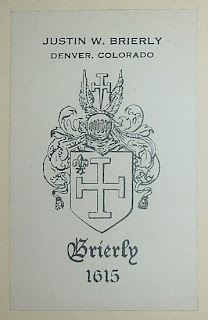 But it wasn’t any particular title I found that initiated this post—it was what I found inside one of those books: A bookplate for one Justin W. Brierly of Denver, Colorado. Name doesn't ring a bell? 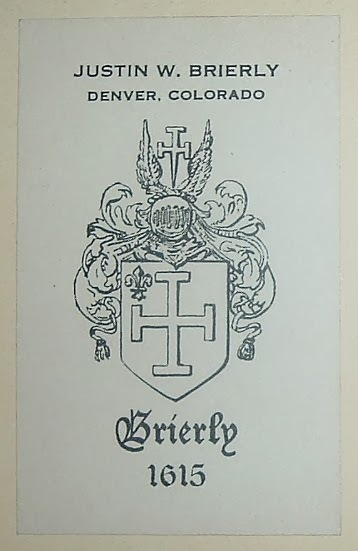 Didn't for me either, but I liked the look of the bookplate, which sports the family crest, name and the year 1615. 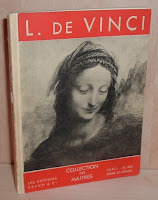 So I bought the book for four bits (cheap French paperback art book from the 1930s) and took it home to research Brierly and see if he was anyone of import. Turns out he was a lawyer and a member of the school board in Denver. I've also read accounts that assert he was a high school teacher and counselor and that he also owned rental properties around Denver. Whether all that is factual or not, it does appear that in 1941 Brierly did meet a troubled teen named Neal Cassady, possibly at one of his rental properties during an inspection. Yes, that Neal Cassady for some who may be asking the question. Brierly took an interest in Cassady, as well as other troubled youth, and enjoyed a mentoring role to them in hopes of turning them around. That he was purported in various accounts to be homosexual, his motives for helping young men have been grist for the rumor mill. Brierly was a Columbia graduate and often encouraged his proteges to attend college there. He saw in Cassady an exceptional mind in desperate need of cultivation and the right kind of influence. Cassady had indeed grown up in tough circumstances and seemed attracted to trouble and danger. Brierly did have an influence on Cassady, encouraging his interests in philosophy, literature, and the arts. With my imagination working overtime, I can even envision Brierly loaning this book with his bookplate to Cassady. Despite Brierly's efforts, Cassady did wind up in jail for a short time, but the two maintained correspondence through letters. In 1946, at age twenty, out of jail, and married, Cassady and his sixteen-year-old bride set out for New York and the cultivated literary life he imagined for himself. They hooked up with another Brierly protege, Hal Chase, who Brierly had previously introduced to Cassady. Chase was attending Columbia with Allen Ginsberg and Jack Kerouac and introduced Cassady to both. And both were soon in such awe of Cassady and his brilliant mind that, although Cassady never achieved the literary success he wanted, he had quite an influence on Ginsberg, Kerouac, and other writers in their circle that formed the genesis of the Beat Generation. 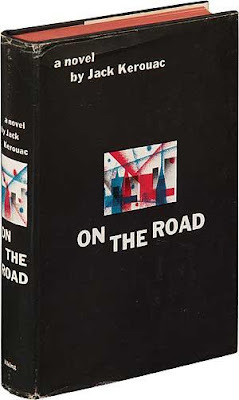 Their friendship and travels in the ensuing years were recounted with fictional characters in Kerouac's classic 1957 American novel, On the Road. Cassady was immortalized as Dean Moriarity, and his mentor, Justin Brierly, also made it into the novel under the name Denver B. Doll. Had it not been for Justin Brierly's friendship with Neal Cassady back in Denver, Cassady would have never met Hal Chase and would have never been introduced to Jack Kerouac. Without Brierly in the picture, would there have even been an On the Road? 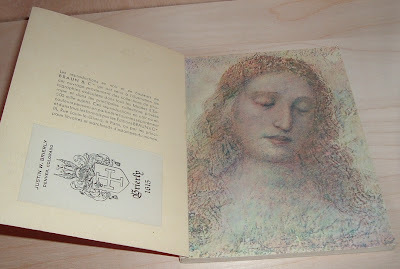 as offered by Manhattan Rare Books. 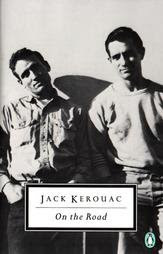 Neal Cassady and Jack Kerouac on the cover of a reprint edition. There's no way of knowing what Kerouac would have written without a Neal Cassady in his life. Nor what Ginsberg and others would have written, for Cassady held court with and influenced them as well. But Justin Brierly's desire to help truant teens make something of themselves indirectly influenced a literary movement. Looking through an old Journal of Contemporary History (Vol. 3, Number 1, 1968) yesterday, I found a library list of newly acquired books. This little list had a big title: The Institute of Contemporary History and Wiener Library Quarterly Select List of Accessions, Winter 1967/1968. But then, the Wiener Library is no ordinary library. The Wiener Library, in London, is the world's oldest Holocaust memorial institution. The recent assault at the United States Holocaust Memorial Museum in Washington D.C. makes this discovery for my collection all the more timely, topical, and poignant. This pamphlet of eight pages (two 8.5" X 10.5" sheets folded and stapled) is the first library accession list I've run across. I don't know how prevalent they are, but I would think the journal had a lot to do with this list getting out to the public. 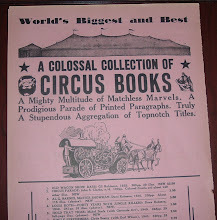 Within the eight pages are an impressively diverse range of topics for such a short list. 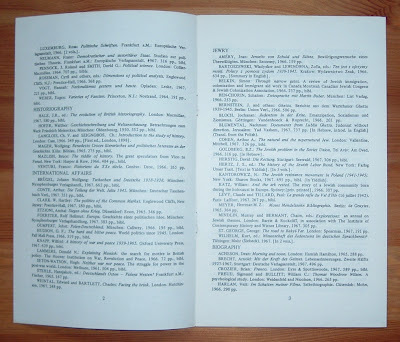 Most of the categories deal with European countries and the Middle East, but there are also categories for books about Political and Social Sciences, Historiography, International Affairs, Jewry, Biography, World War II, and the U.S.A. The library's homepage states the history best, so I'll copy it here. 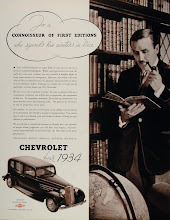 First, though, a word about the connection between the journal where I discovered the list. I assumed there was a connection between the list and the journal because of the wording in the two titles. But the journal offered no other clues that I could see. The description of the library on the Web site did, however. 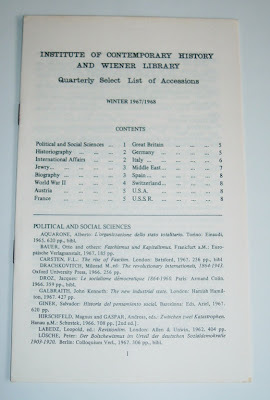 Dr. Alfred Wiener, who started the library in 1933 in Germany (the collection was moved to London in 1939), died in 1964 and was eventually succeeded by Walter Lacqueur, who started the Journal of Contemporary History. I had another look at my 1968 journal and found him listed as publisher. He was also behind the establishment of the Institute of Contemporary History, which is included in the title of the accession list. The institute was created for scholarship in the field of modern European history. 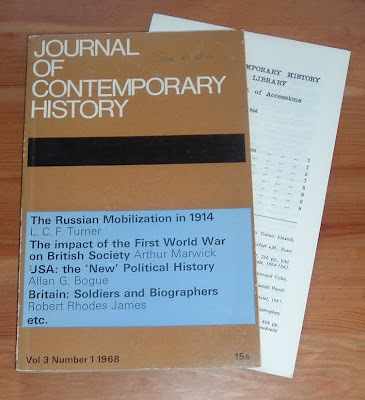 Quite likely, the accession list was inserted in the journal for subscribers' information. In 1956 the Library was forced to move from Manchester Square and temporary accommodation had to be found, with some material being put into storage. A new premises was found in Devonshire Street (where the Library remains today) and the future became a bit more calm. In 1961 Wiener announced his retirement as director and the appointment for this vacant post was not successful. Temporarily C.C. Aronsfeld took over as acting director and the library suffered under financial difficulties. Yesterday, as the D-Day anniversary approached, I saw a news report about an American vet who had landed at Normandy in the D-Day invasion during World War II 65 years ago. This vet spoke about what the Allies had accomplished and gave a lot of credit to the home front. Without the efforts on the home front--those individuals working back home for the war effort in factories, communities, and individual homes--they would not have been successful, he said. Fifteen years ago, during the 50th anniversary of D-Day, my wife and I toured Normandy, went to Omaha Beach where the American forces landed, and viewed and reflected on all the white crosses at the cemetery. My first thoughts there were about the thousands of soldiers who died that day, represented by all those crosses. How, or what, could I think otherwise? And I thought about those who survived the German defensive and secured the beachhead. As we visited various battle sites in Normandy, such as Sainte-Mere Eglise, met and talked with D-Day vets, I don't remember thinking of the home front and their role in the war. I doubt most people in that setting would. But the old soldier in the television interview yesterday put it in focus for me. And so did a book jacket from a book published during war time. Yesterday, after seeing the interview, I went to work cataloging books and I came across a box of books I had set aside months ago to deal with later. One of the books I fished out was Ann Rutherford and the Key to Nightmare Hall, by Kathryn Heisenfelt (Whitman Publishing Company, Racine, Wisconsin, 1942). As I thumbed through the book, I couldn't remember why I had set it aside for later. It appeared to have no redeeming characteristics for either resale or my personal collection. 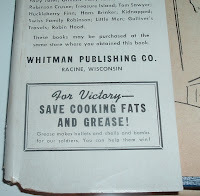 For Victory--SAVE COOKING FATS AND GREASE! Grease makes bullets and shells and bombs for our soldiers. You can help them win! It feels a bit eerie that I would choose that day to resume work on that box of books and find the related World War II reference. Whether Freudian forces of subconscious theory were in play or some other-worldly ordination in effect, I merely took it as a happy coincidence--one I should blog about, as it related to my ephemera collection. Whitman published a series of juvenile books during the war that promoted patriotism, The Fighters for Freedom Series, which featured heroic men and women. For those and other books in other series, such as the one that featured Ann Rutherford, they used their jackets to promote patriotic behavior. This kind of contribution, no matter how small, was part of a big-picture network heavily promoted by government offices such as the Department of War Information, created by President Roosevelt in 1942 to mobilize support at home for the war. Lauren Roberts, over at BiblioBuffet, has written an excellent article on the subject, which I discovered while searching the Web for information about the home front contributions to the war effort, as seen through the lens of the print media and related ephemera. No need to reinvent the wheel here, and I doubt I could do as fine a job, so click here to read Lauren's informative and interesting piece. She explains why there was a need for such a massive home front campaign and offers some fine examples of ephemera representative of the era. Pertinent to my book jacket's request for cooking fats and grease, she even refers to a booklet, A Guide to Wartime Cooking by H. J. Heinz, that states "two pounds of waste fat will make enough glycerin for five anti-tank shells." That answered my question about how cooking fats helped make bombs. 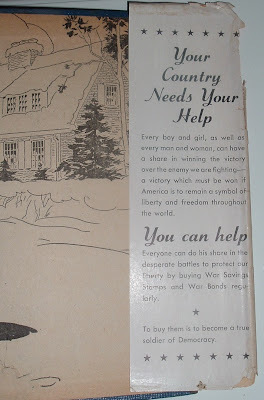 The rear flap of the book promoted another way to help the Allies win the war: Buy War Savings Stamps and War Bonds. And buy them regularly. To do so, the ad proclaims, is to "become a true soldier of democracy." For this blog, I have never referred to a book's jacket or dust cover as ephemera, or bibliophemera. By definition, ephemera, as related to paper, refers to those items that are not meant to last beyond their intended use, such as ticket stubs, receipts, brochures, or ads. Things we keep a short while and then throw away or destroy. 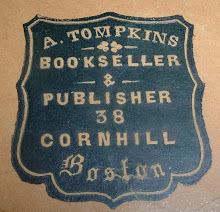 Book jackets are intended to be kept and to protect the book's covers from dust and soiling. So I've stretched the definition here to include this jacket. But it does appear to be nearing the end of its intended use, as tattered as it is. And now an unintended use has surfaced--that of a history lesson some 67 years later on the government's use of media, and the media's role, in rallying the "troops" back home to create a national mood favorable to patriotic participation in the war effort. From the propaganda machine, if you will, to the war machine, from the soldier on Omaha Beach in France to the housewife back home saving a pan of cooking fat, it took a united effort on all fronts to defeat the enemy. 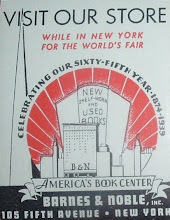 In their own way, book jackets became a part of the effort with patriotic encouragement from publishers such as Whitman.